Ho Ho Ho, Merry Christmas guys! 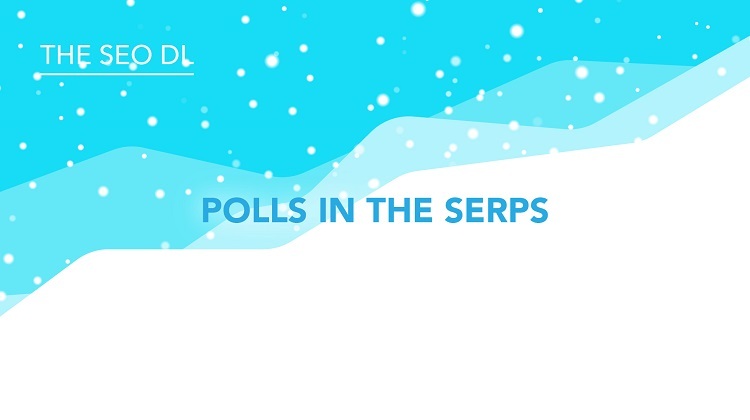 Here we are a full year later and many topics covered off in our monthly SEO update. Can you believe it was way back in January when we were banging on about AMP, Voice Search and Google My Business! So, let’s get stuck in, pop on that warm cup of cocoa and sit back and relax. We’ll ease you in gently, as it is December and we are feeling generous! 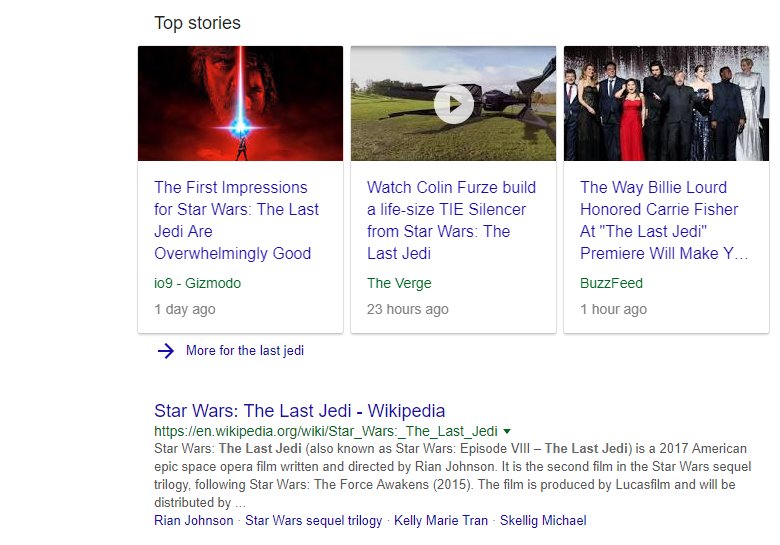 One of the lads in the office (Marty) informed me the other day that when he searched for ‘The Last Jedi’ he stumbled on an interesting new SERP feature from Google. 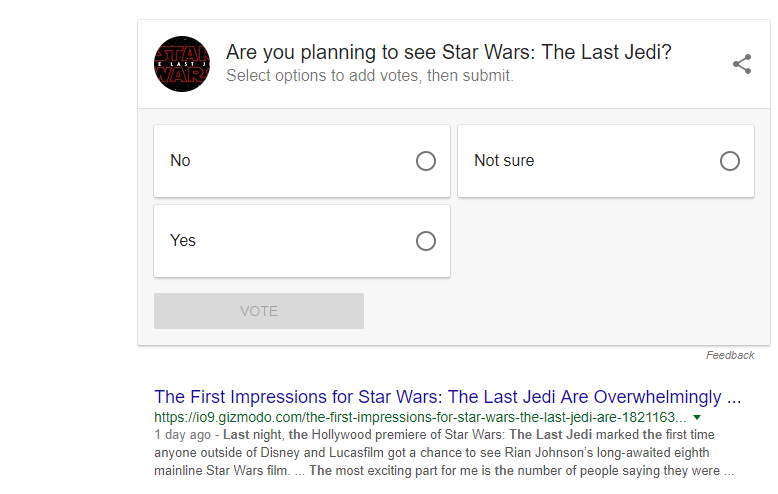 ‘Polls’, go on give it a go search for ‘The Last Jedi’, the interesting thing is we tested this on numerous other movies and the feature is nowhere to be seen?? This is what you get when you fill it out, interesting to see over 200,000 submissions! Its interesting to see Google constantly informing their AI of our every move! At this point in time, Google has already crawled your website and placed their own version of Google My Business and Google Places up on their index. Meaning that you more than likely have an un-optimised profile floating around the web, potentially losing out on possible conversions as you sit here and read this. Those days are over, by following these simple steps, you can grab that Google real estate and turn it into a valuable asset for your online business. Features like Google’s Local Search results (shown in the screenshot above), deliver a list of nearby businesses and some highly relevant information required by searchers to find a specific business (e.g., address, business hours, category, reviews) and potentially buy something, highlight the importance for a GMB listing for both new and established businesses. Google’s Knowledge Graph also pulls verified Google My Business information to help generate details for its database about businesses and related entities that are relevant to specific searches. 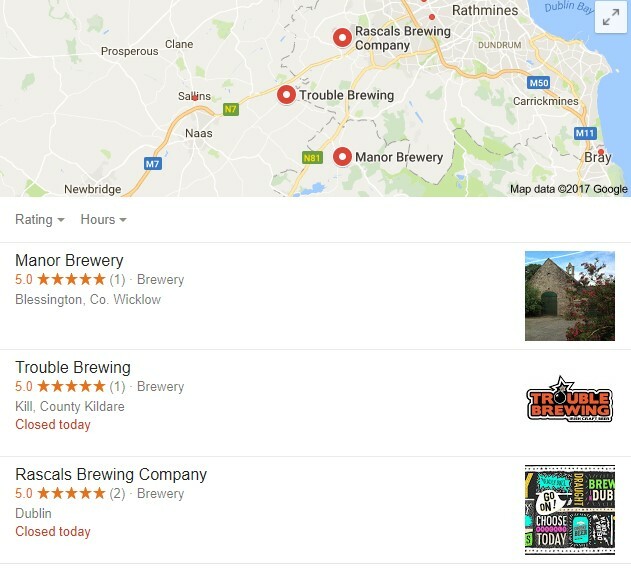 A businesses Google Maps location is then generated to match with traditional Google Search for easy access and search ability. 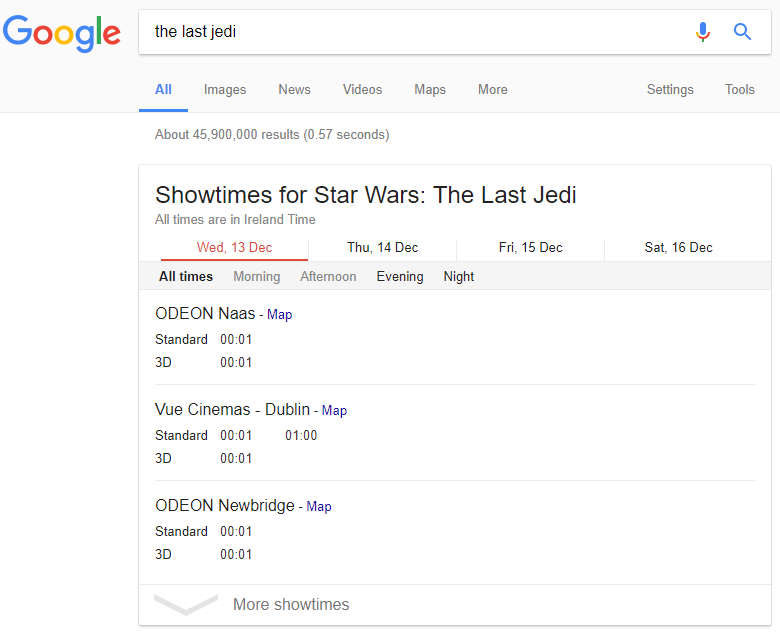 It certainly helps that the clear majority of organic searches come from Google (around 95 percent for Irish search engine market share), further illustrating the value of a GMB listing. The information you provide about your business can appear in Google Search, Google Maps, and on Google+. Conduct a Google Search to ensure your business doesn’t already have a GMB listing. If there, then you just need to claim it. Enter your most important business information (business name and address). If already claimed follow this guide to get your business back. Fill out the remaining options with accurate business details, ensuring everything is spot on and grammatically correct (capitalise your business name, street names, etc. ), and be sure to find the best relevant category for your business. Enter your service area information. You can set your service area based on the cities that you serve, or on a given area around your location. After all this you’ll need to verify your listing. This is essential for accurate visibility and performance of your business listing. It’s probably easiest to verify your listing by postcard. 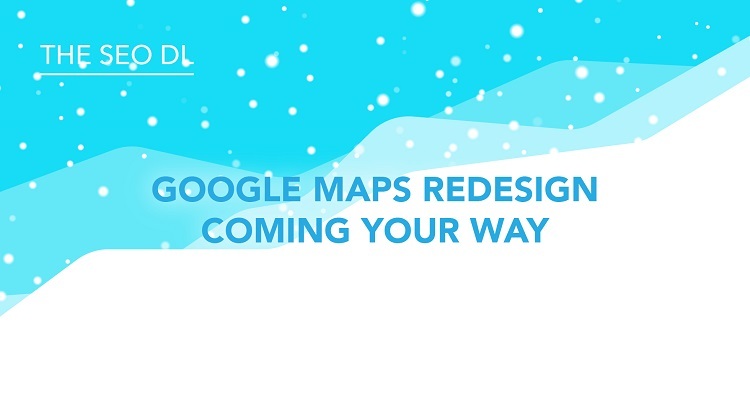 This helps Google weed out the false listings that will only misdirect users and derail the usefulness of Google Search and Maps, among other tools. Google will send you out a neat little postcard with a code on it. It usually takes a week, when you receive your postcard, log in and verify with the code provided and your business will officially be live. Offer the most detailed and accurate information possible. Include important keywords and search phrases to your business listing since your business website is listed directly within your GMB listing. Add Photos. Businesses with photos on their listings receive 42% more requests for driving directions on Google Maps and 35% more CTR to their websites than businesses that without photos, according to Google. Responding to customer reviews shows your business values its customers and the feedback that they leave regarding it. Positive reviews have a positive effect on potential customers when researching your business, they will also increase your business’s visibility in the search results. Encourage customers to leave feedback by creating a link they can click to write reviews for your business. The most important piece of imagery in your GMB listing is obviously your profile photo. There likely won’t be an image that gets more exposure, and there likely isn’t one that will have more of an impact either. Your business profile photo should not be the brand logo itself, but of something appealing and encompassing of the brand, what it stands for, and/or what your business offers. Logo image: Google recommends using a square-sized image of your logo. 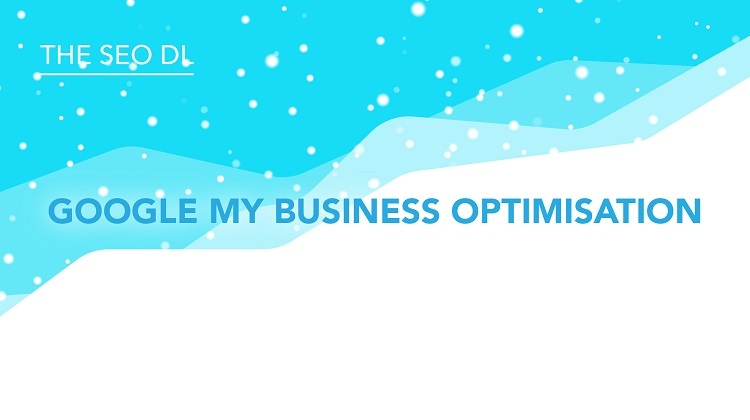 Cover photo: Use this opportunity to express your brand’s personality. This is the large photo featured at the top of the Google+ page, it will always be cropped to fit a 16:9 aspect ratio. Additional photos: Use as many high resolution imagery to enhance your presence and first impressions when potential customers are researching your brand and its offerings, include the interior and exterior of the business (where appropriate), and other general photos that summarise your business and what it can do for its customers. Quality: The photo should be in focus and well-lit, and have no Photoshop alterations or excessive use of filters. The image should represent reality. Once you've got everyting verified and on-brand, it's time to start pleasing your audience with Google Posts and to formally commence a review-gathering process for your super new Google My Business listing! What is happening me?? Recently I went into the city and clearly knew where I was going, Store Street (no, not the Garda Station!!) and decided as I was coming down the quays to throw on ‘Google Maps’…bad idea! About half an hour later and driving through every little Cobble Street in Smithfield I decided to go back to ‘My Brain’ and follow my own route, getting there in about ten minutes. Why did I think that Google Maps would be better than my own local knowledge is anyone’s guess? The moral of this story is, are we all going to end up depending on the powerhouse that is Google Maps, despite its flaws? Will we lose the ability to navigate using our own minds? That remains to be seen! They also state in this forum that they are improving the whole driving experience delivered. Fingers crossed! So, back to some real nitty gritty SEO information, for those of you who understand the value of links in Google’s ranking algorithm, you will be aware that Google generally view links as a ‘vote of confidence’ to your site. However, as links have been proven to be so valuable, there has been widespread abuse of links throughout the years. Thankfully, Google take any link manipulation very seriously and have baked in numerous algorithms ‘Penguin’ in particular into their core algorithm to deal with any manipulation of links. 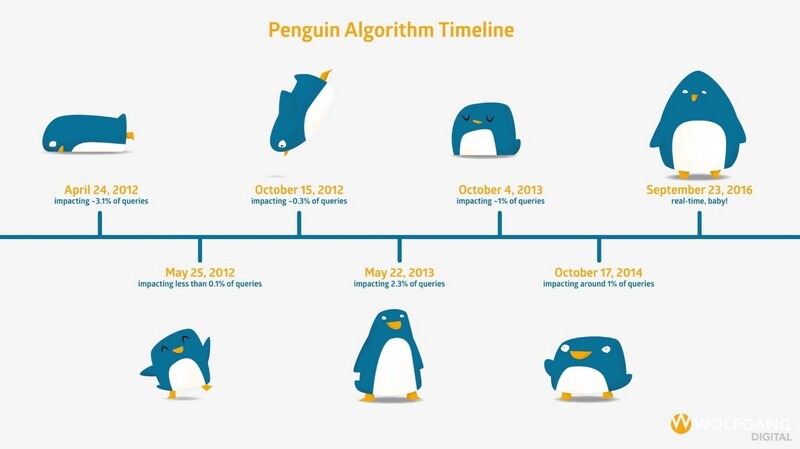 Here is the Penguin timeline. No-follow links were introduced by Google to mark links that should not be used for the ranking algorithm. Their main purpose was to put an end to comment spam in blogs. The main idea was that people would stop spamming blogs and other pages with links if these links didn't influence rankings anymore. Essentially, by placing the following mark-up; rel="nofollow" on a link, this would tell crawlers that the link should pass no ranking value to the receiving page. However, when analysing and working on our clients websites, we always examine a backlink profile to ensure it follows Google’s own Search Quality Guidelines, this includes having both Follow and No-Follow links. How to correctly implement No-follow links. As these have no ranking value, anchor text of no-follow links is useless, so we recommend using attractive anchor text that encourages people to click on your link. The anchor text is about getting clicks. If your no-follow link is presented to the right people (Press Releases), you can get additional regular links through that link. If your press release is read by the right people, these people will add further links to your site, driving many people visit your website. SEO is about getting visitors, not about getting rankings. As long as a link sends real people that are interested in your products and services to your website, it is a good link. So take our advice, SEO is not about building many, many links, it is about driving relevant traffic that will convert when onsite. 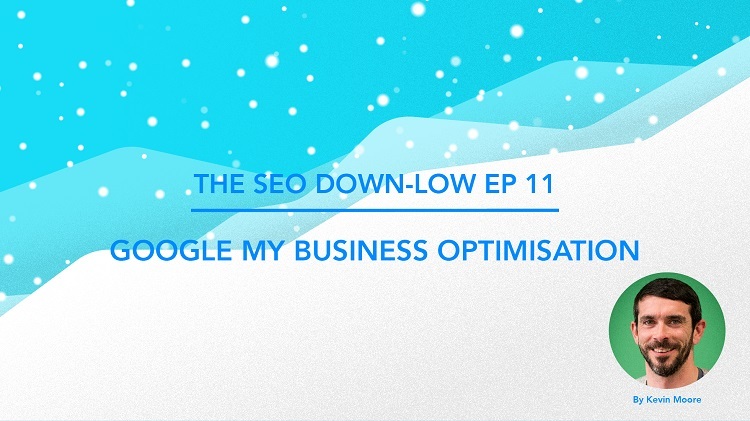 So there we have it, a full year of SEO Down-Low editions, jam packed with actionable SEO insights to add to your digital marketing arsenal. 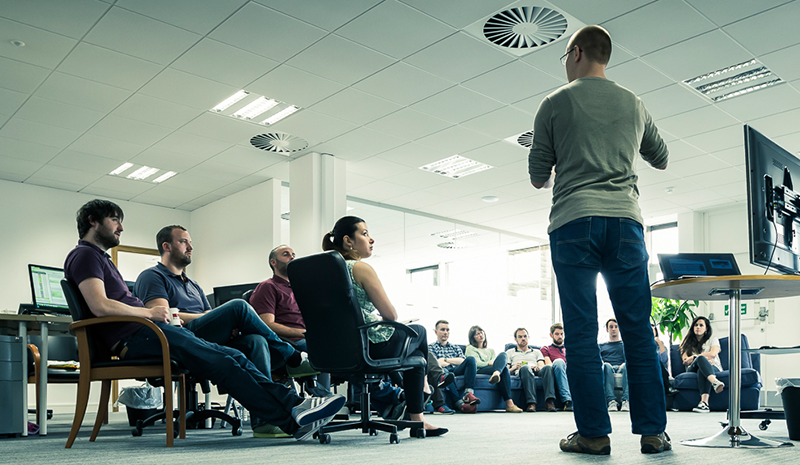 We really hope you enjoyed them and if you wish to push this knowledge any further check out our SEO Training Course. I have to admit, it's been a pleasure, Merry Christmas, I hope you have a cracker!